December discussion: December is a key month for Hollywood if it's going to set a domestic boxoffice record for the year. Right now, it's possible that last year's record setting $11.1 billion domestic total can be toppled. Through last weekend, according to comScore, 2016 is running about 4.0 percent ahead of last year -- $10.28 billion vs. $9.88 billion. Normally, you'd figure that this year should be able to maintain that lead over 2015. The only problem is that last Dec. 18 Lucasfilm and Disney's "Star Wars: The Force Awakens" opened to $248 million. Through Dec. 31, it had done $652 million domestically on its way to $936.7 million. It also wound up doing $1.1 billion internationally for a worldwide cume of $2.1 billion. How do you overcome domestic numbers like those? This year's 800-pound gorilla in the Hollywood jungle is Lucasfilm and Disney's "Rogue One: A Star Wars Story," opening Dec. 16, but it's not quite the same as "Force." While "Rogue" is the first theatrical spin-off from the "Star Wars" franchise, it's not a "Star Wars" episode. It's set in the "Star Wars" universe, but it's not part of the classic Luke Skywalker storyline -- aside from a brief appearance by Darth Vader (voiced by James Earl Jones). 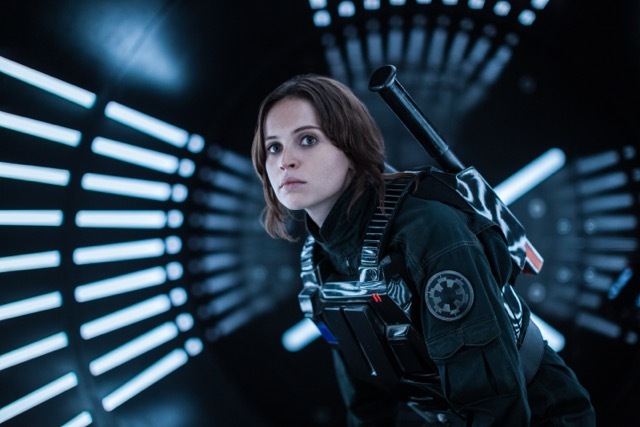 Directed by Gareth Edwards ("Godzilla"), "Rogue" stars Felicity Jones, Mads Mikkelsen and Riz Ahmed. It takes place shortly before the beginning of George Lucas' original "Star Wars" episode. While there will be a strong connection for moviegoers to a world with which they're already very familiar and that should translate into enviable ticket sales, it's still not likely to generate the same phenomenal level of success that a new "real" episode of "Star Wars" would. If "Rogue" can't match "Force," the only way to maintain the year's boxoffice lead is through the combined additional strength of other key films in the December marketplace. That could work. It helps, for instance, to start out by having two holdover hits from November to prop up the early December boxoffice. Last weekend saw Disney's PG rated 3D animated comedy adventure "Moana" hold on to the top spot on the chart in its second week with $28.4 million and a domestic cume of $119.9 million. It's also done, per Disney, $57.7 million internationally for a global cume of $177.4 million. Warner Bros. and Heyday Films' PG-13 rated 3D fantasy family adventure "Fantastic Beasts and Where to Find Them," a "Harry Potter" spinoff created by J.K. Rowling, placed second again in its third week with $18.5 million and a domestic cume of $183.5 million. Last weekend's only new wide arrival, Blumhouse's PG-13 horror thriller "Incarnate" came in ninth with $2.6 million. It reportedly cost only $5 million to produce. The post-Thanksgiving weekend is traditionally one of the year's lowest grossing periods. All films in the marketplace, according to comScore, did about $96 million, down about 1.9 percent from $97.8 million this time last year. Here's a look at the wide releases on deck from now through New Year's weekend that Hollywood will be counting on to help make 2016 a record setting year domestically. DEC. 9-11: Two wide releases will be competing for moviegoers' time and money this weekend. That should be harder than usual because in early December there's big competition from holiday shopping, particularly for adult women. Not surprisingly, both early December titles are rated R and should play best to young adult men and women, who are more available for moviegoing. Paramount, DreamWorks and Reliance Entertainment's R rated comedy "Office Christmas Party," opening at about 2,800 theatres, stars Jason Bateman, Olivia Munn and Jennifer Aniston. It's directed by Josh Gordon & Will Speck, directors of "The Switch," which also starred Aniston and Bateman. Aniston plays Carol, a tough CEO who wants to close the company branch run by her hard-partying brother Clay (T.J. Miller). Clay and his Chief Tech Officer (Bateman) rally their team with an epic office Christmas party to impress a potential client and do a deal to save their jobs. EuropaCorp's R rated political thriller "Miss Sloane," which opened in limited release for Thanksgiving, goes wide to about 1,600 theatres. Directed by John Madden ("Shakespeare in Love"), it stars Jessica Chastain, Gugu Mbatha-Raw and John Lithgow. Chastain plays Elizabeth Sloane, a highly sought after Washington lobbyist. Known for her cunning and her successful track record, she always does whatever it takes to win. But when Sloane takes on the most powerful opponent of her career, she realizes the cost of winning may be too high. DEC. 16-18: Four new wide openings will make their way into the mid-December movie marketplace just as holiday shopping and partying are really heating up. Lucasfilm and Disney's PG-13 sci-fi action adventure "Rogue One: A Star Wars Story" is a very safe bet to top the chart. Directed by "Godzilla" director Gareth Edwards, it stars Felicity Jones, Mads Mikkelsen and Riz Ahmed. It should play best to men, who are typically the core audience for sci-fi. "Rogue," as discussed above, is the first theatrical spin-off from George Lucas's "Star Wars" franchise. Lionsgate and Marc Platt Productions' PG-13 rated musical comedy drama "La La Land," starring Emma Stone, Ryan Gosling and Finn Wittrock, goes wide after opening in limited release Dec. 2. It's a Los Angeles set musical about a jazz pianist (Gosling) in love with a struggling young actress (Stone). Its writer-director, Damien Chazelle, was an adapted screenplay Oscar nominee in 2015 for "Whiplash," which Academy members also nominated for best picture. It won Oscars for supporting actor (J.K. Simmons), film editing and sound mixing. "LLL" was a film festival hit at Venice, Telluride and Toronto this fall, which immediately put it on track as an Oscar contender. Last week it began delivering on that early buzz by winning best picture in the New York Film Critics Circle's Dec. 1 vote. It also landed 12 nominations Dec. 1 from the Broadcast Film Critics Association for the Critics Choice Awards. Among its BFCA noms are: best picture, director, actor (Gosling) and actress (Stone). While "LLL" is off to a strong start that's propelled it to Oscar best picture frontrunner status, it will need to survive months of brutal campaigning for Academy members' votes. It doesn't help that Oscar voters tend to favor dark serious dramas over musicals or comedies when it comes to best picture votes. Also, Academy members are eager to applaud diversity this year and diversity is not one of "LLL's" strengths. Warner Bros., New Line Cinema and Village Roadshow Pictures' PG-13 rated drama "Collateral Beauty" is directed by David Frankel ("The Devil Wears Prada") and stars Will Smith, Keira Knightley and Kate Winslet. It should play best to adult men and women. Smith plays a successful New York adman who after suffering a great tragedy retreats from life. When his friends try to get him to reconnect, he seeks answers from the universe by writing letters to Love, Time and Death, which bring unexpected personal responses that help him understand how these constants interlock in a life fully lived. STX Entertainment's PG-13 rated romantic sci-fi adventure drama "The Space Between Us" is directed by Peter Chelsom ("Hector and the Search For Happiness") and stars Carla Gugino, Janet Montgomery and Britt Robertson. After a space shuttle embarks on a mission to colonize Mars, it's learned that one of the astronauts is pregnant. Shortly after landing, she dies from complications while giving birth to the first human born on the red planet and without revealing who the father is. When the child is 16, he's searching for clues about his father, and the home planet he's never known. After he finally gets a chance to go to Earth, scientists discover his organs can't withstand Earth's atmosphere. Eager to find his father, he escapes from the team. DEC. 21-25: The crowded five day Christmas weekend will see three films open wide on Wednesday, one on Friday and two on Sunday. Universal and Illumination Entertainment's PG rated 3D animated comedy drama "Sing" is from the creators of "Despicable Me" and "The Secret Life of Pets." It opens Dec. 21 and should play best to families. How well "Sing" does will play a key role in whether Hollywood sets a new domestic boxoffice record for the year. Directed by Garth Jennings ("Son of Rambow") & first time feature director Christofe Lourdelet, it stars the voices of Matthew McConaughey, Reese Witherspoon, Seth MacFarlane, Tori Kelly, John C. Reilly, Taron Egerton and Scarlett Johansson. "Sing" takes place in a world like ours that's entirely inhabited by animals, including Buster Moon, a dapper koala whose once-grand theater's fallen on hard times. Buster's got one last chance to turn things around by producing the world's greatest singing competition. 20th Century Fox and Regency Enterprises' fantasy action adventure "Assassin's Creed" is directed by Justin Kurzel ("Macbeth") and stars Michael Fassbender, Marion Cotillard and Jeremy Irons. It opens Dec. 21 and should play best to adult men. Fassbender plays Callum Lynch, whose genetic memories are unlocked through revolutionary technology that lets him experience the adventures of his ancestor, Aguilar, in 15th Century Spain. Columbia and Village Roadshow Pictures' PG-13 rated romantic sci-fi adventure drama "Passengers" is directed by Morten Tydlum ("The Initiation Game") and stars Jennifer Lawrence, Chris Pratt and Michael Sheen. It opens Dec. 21 and should play best to adult men. During its 120 year voyage to a distant colony planet, the Starship Avalon, with 5,259 people on board, suffers a malfunction in two of its sleep chambers. When two hibernation pods open prematurely, two people awake (Pratt and Lawrence) and are stranded on the spaceship, which is still 90 years from its destination. 20th Century Fox and TSG Entertainment's R rated comedy "Why Him?" is directed by John Hamburg ("I Love You, Man") and stars Zoey Deutch, James Franco and Bryan Cranston. It opens Dec. 23 and should play best to adult men. Cranston plays an overprotective dad who visits his daughter at Stanford over the holidays, where he meets his biggest nightmare -- her well-meaning but socially awkward Silicon Valley billionaire boyfriend (Franco). Paramount and Scott Rudin Productions' drama "Fences" is a likely contender for best picture and other prime Oscar races. Directed by Denzel Washington ("Antwone Fisher"), it stars Denzel Washington, Viola Davis and Mykelti Williamson. It opens Dec. 25 (after opening an exclusive run Dec. 16) and should play best to adult men and women. Set in the 1950s, it's the story of an African-American father (Washington) struggling with race relations while trying to raise his family and coming to terms with how his life has gone. The Weinstein Company's R rated adventure thriller "Gold" is directed by Stephen Gaghan ("Syriana") and stars Bryce Dallas Howard, Matthew McConaughey and Toby Kebbell. It opens Dec. 25 and should play best to adult men. In "Gold," an unlikely pair team up to travel to the jungles of Indonesia to find gold. Bottom line: Oscar contenders are emerging almost daily as early December brings the usual critics groups awards and noms. In the voting thus far, there's been particular enthusiasm for "La La Land" (discussed above), Amazon Studios and Roadside Attractions' R rated drama "Manchester by the Sea" and A24 and Plan B Entertainment's R rated drama "Moonlight." Directed and written by Kenneth Lonergan ("Margaret"), "Manchester" stars Casey Affleck, Michelle Williams and Kyle Chandler. Lonergan is a two time original screenplay Oscar nominee – in 2001 for "You Can Count on Me" and in 2003 for "Gangs of New York." "Moonlight" is directed and written by Barry Jenkins ("Medicine for Melancholy") and stars Mahershala Ali, Shariff Earp and Duan Sanderson. It's based on an unproduced play, "In Moonlight Black Boys Look Blue," by Tarell Alvin McCraney, who has story credit on the film. Sunday saw the Los Angeles Film Critics Association applaud "Moonlight" as best picture and Jenkins as best director. Last year, LAFCA gave top honors to "Spotlight," which went on to win Oscars for best picture and original screenplay (Josh Singer & Tom McCarthy). With diversity being a major goal this year for Academy leaders and members, "Moonlight" has a built in advantage over both "LLL" and "Manchester." "Moonlight's" other LAFCA wins were for: supporting actor (Mahershala Ali) and cinematography (James Laxton). While the musical comedy drama "LLL" had no LAFCA wins, it did come in as the runner-up in the group's best picture, director, editing and cinematography votes. So they almost loved it. In fact, LAFCA spread their love around quite a bit -- with best actor going to Adam Driver for "Paterson," best actress to Isabelle Huppert for "Elle" and "Things to Come" and supporting actress to Lily Gladstone for "Certain Women." The National Board of Review named "Manchester" its best picture Nov. 29. The drama also won best actor (Affleck), original screenplay and male breakthrough performance (Lucas Hedges). Last year, NBR's best picture winner was "Mad Max: Fury Road." The best picture Oscar winner, "Spotlight," did not win any NBR awards, but did make the group's Top 10 Films list. NBR also provided some encouragement for "Moonlight," voting it awards for best director (Jenkins ) and supporting actress (Naomie Harris). The New York Film Critics Circle announced its awards Dec. 1 with best picture going to "LLL." There also were three awards each to "Moonlight" and "Manchester." "Moonlight" took home wins for director, supporting actor (Ali) and cinematography (James Laxton). "Manchester's" wins were for actor (Affleck), supporting actress (Michelle Williams) and screenplay. Last year's NYFCC best picture winner was "Carol," which received six Oscar noms, but not for picture or directing, and did not win in any of its categories. Dec. 1 also saw noms from the Broadcast Film Critics Association for its Critics Choice Awards, which will take place Dec. 11. "LLL" was the dominant title with 12 noms, including best picture, director, actor (Ryan Gosling) and actress (Emma Stone). There were 10 noms apiece for "Moonlight" and Paramount's PG-13 rated sci-fi mystery drama "Arrival." "Moonlight's" noms included best picture, supporting actor (Ali), supporting actress (Harris) and director. "Arrival" is directed by Dennis Villeneuve ("Sicario") and stars Amy Adams, Jeremy Renner and Forest Whitaker. Its BFCA nods included best picture, director and actress (Adams). Last year's BFCA winner was "Boyhood," witch received six Oscar noms and won for supporting actress (Patricia Arquette). Awards marketers are now holding their breath for the BFCA wins (Dec. 11) and the Hollywood Foreign Press Association's Golden Globes noms (Dec. 12). Also upcoming are the Screen Actors Guild noms (Dec. 14) and the Producers Guild of America noms (Dec. 15). While the Globes may get the most media attention, the real bellwethers for the Oscars are usually the PGA and SAG.